So many plugins, which ones to choose? 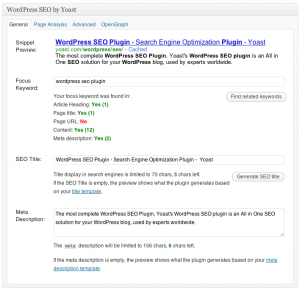 It can be difficult at times knowing which ones to choose, it seems that the options are endless and installing testing and seeing if they are any good can be difficult if not tiresome, so I have decided to include what I believe to be some of the best SEO Plug-ins for all WordPress users. One being an absolute gem! I will add similar posts to this in future but these are the 3 I believe are a must have. This isn’t that much of a well kept secret but more of a necessity to have in ANY WordPress website that you build. It gives all the possibilities for the novice SEO user to the more advanced and experienced search engine marketer. This is all i need to say, no big fancy explanation this time, just install it, its a necessity for your plug-in arsenal. As your website grows..and grows.. and becomes a bit of a monster with all the information you spread, getting the right information to display quickly for browsers ( not mentioning any names but *cough*internet*cough* explorer *cough cough* ) can be quite a pain in the bottom and you know what? Internet users are fickle chaps and not only are the users fickle but if the site is too slow it will effect your SEO rankings as well! One tool to speed up your website is WP-Optimize, its a great free tool. What it does is remove all the old revision posts, drafts, spam, unapproved comments and optimizes all those databases that run your lovely jubbly website. It is a simple plug-in and can save you valuable seconds on load time. And my final plug-in tip for this post is probably something I am a bit hesitant to share, its a bit of a James Bond like secret weapon for serious bloggers because it is absolutely amazing! Probably one of the best kept secret by many top websites and my favourite Wordpress plug-in right now and as i am a nice guy, I’m going to share it with you lovely people… a content optimisation plug-in! available for 4 posts a month for free ( see site for more details ). So You’ve being a good webmaster making sure to include a keyword in your title, permalink, meta description and image alt tags but what if 100,000 other webpages are also targeting that keyword you are also wanting to attract your audience from and they have been around for longer? For starters, they will have gained more links and a stronger reputation for being an older webpage than your own so how can you achieve a higher search engine ranking if thats the case? Content optimisation is for this exact purpose! It helps you optimize your site using not only your keyword but keywords that are relevant to your main keyword, so you can continue to write interesting content but with more probability of being found by search engines. I started using this plug-in and discovered that my traffic was increasingly dramatically after only 1 new blog post, I am pretty confident in saying that if you use this plugin it will help you deliver the right audience to your site.